With Valentine’s Day just on the horizon, I thought I’d get together the obligatory festive blog post. Love is in the air between Facebook and mobile payments solution firm Bango as they signed an agreement this week. Although the love nest may be a little crowded, with deals already drawn up with Amazon and EA, the new relationship with Bango indicates that Facebook is keen to replicate on mobile the success of in-app purchases via desktop. With all the distinct pleasures of sharing and competing with friends, in the most convenient way possible, is there a social mobile app store on the horizon? Relations have become increasingly frosty between Apple and rogue developers who are playing the App Store system to get high rankings, and therefore more downloads. We have always advised our partners against such practices, offering them advertising-led solutions instead. Apple takes very seriously its position in high quality and rigorous standards. Hell hath no fury like a tech giant scorned. For romantics, how to pull of the perfect marriage proposal. 88% of people are waiting for their soulmate, 50% of people blow the surprise, and the average age for marriage in the US is 27 for women and 29 for men. So either breathe a sigh of relief of start to panic! And for those who can’t get enough love, Valentine’s Day by Numbers. Did you know, the festival of fertility was first celebrated in Ancient Rome? And finally, an elaborate proposal. You’d have to be very confident she was going to say yes! This entry was posted in Uncategorized on February 11, 2012 by kirstystyles1. My week in mobile: Facebook, Amazon and er.. Zombies! The tech world is usually overshadowed by one mammoth announcement or another. And this week it was definitely Facebook.But on Tuesday, Amazon, one of the other great success stories of the last few years reported its Q4 2011 results and while sales rose 35 percent, profit declined 58 percent. This bitter-sweet news for Amazon comes after excellent Kindle and Kindle Fire sales over Christmas. Commentators are convinced that the Fire is only good for reading, and the research seems to ring true so far. But that’s no bad thing. Their move into tablets pushed them further along the value-chain from ‘just a retailer’ to publisher of books and entertainment too. They should target the over 60s – they buy lots of books right? Elsewhere, an embarrassing revelation passed largely under the radar. TEAM BOLD. We put some faith in RIM having a rethink, after a year that has seen their share price drop a whopping 75%, and come out all guns blazing with an excellent plan to target their core, loyal, keyboard loyalists. Instead, they did this. GoGo Girl, Max Stone, Justin Steele and Judy Foreal have taken to the streets to try and reclaim the youth of today, who most adults know are pretty unreachable. Especially from a politically correct cartoon crime fighting team. You can almost see their looks of pure disdain. Oh RIM, are you for REAL? What is real is a massive interest in corporate apps, so we sent @Sleighty out to talk about how we have helped some global clients design and build internal apps and app stores at the Square Group event about iPads in Enterprise, exploring how they help reduce costs, create efficiencies, help frontline staff engage with consumers and speed up what is often still a paper-based system. Large corporations could save millions. And with 1 in 5 workers using Apple products for work, this is yet another area where Apple is cleaning up. And finally, Zombies, Run! A new exercise app game crowd-funded by Kickstarter. If you hate running, you’ll love this. Nothing like feeling that someone’s chasing you when you’re out in the city alone. This entry was posted in Uncategorized on February 3, 2012 by kirstystyles1. 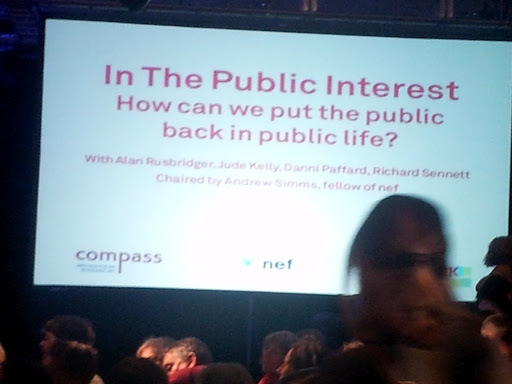 In the Public Interest: How can we put the public back into public life? Hundreds turned out at the Southbank to see Compass, the left-leaning pressure group and the New Economics Foundation, the ethical economic think tank, host a panel of eminent thinkers and a lively audience for the first of its public assemblies, where participation was actively encouraged. Jude Kelly, Artistic Director at the Southbank Centre, Alan Rusbridger, editor of the Guardian, Richard Sennett, writer, academic and author of ‘The Fall of Public Man’ and Danni Paffard, from the fledgling economic activism group Move Your Money, all offered their assessment of where we are, what is wrong and how we might collectively improve our lot. The Southbank Centre, a democratic space with no one front door, felt like an excellent place to discuss the lack of civic space – in both literal and metaphorical terms – but sponsorship of the building by the oil giant Shell, much like that of the Tate by disgraced BP, leaves all sustainable thinkers wanting. The hosts were after ideas – so we got the ball rolling. Universities should be the place for public debate as they appear to have been in the past. Journalism of the last 10 years has failed. We are a society with taboos and nowhere to discuss them. Congregation space. A public forum. Temples. Alain De Botton. ‘Public debate’ is via political parties and the arbiter is the media. Phone hacking has prompted a big look into press ethics and standards. In July, when the scandal kicked off, we were within two days of letting News Corp, that has ‘squatted over public life’, double in size. It involved everyone, from politics to the police. Common sense. Unanimous opposition. And still nothing in law. There is now an open public interest debate about regulation, privacy, libel and subterfuge. What is the public interest? Tabloids are commercial organisations.Solidarity means being serious about the public interest. Do not just pay lip service. Who decides the public interest? Leveson – where is the public voice? The Scott Trust, owners of the Guardian, allowed them to produce the story.In 17 years as editor, they only made money in 12. Now none are making money. Conventional commercial terms do not value the public interest. Local newspapers are going out of business. Plurality? New forms are media are where public interest journalism can occur. The public needs to take more of an interest in itself. How do we make banking better? Where is the public accountability? UK Uncut has highlighted tax avoidance versus public sector cuts. £95billion in tax avoidance per year. Banking receives £100billion in subsidies. Your bank card is so against everything you stand for. ‘You have all my money’. We have to engage ourselves. Ethical consumerism in the banking sector. Active economic citizens. Understanding. ‘This is the new fair trade’. The ‘campaign of our time’. In the US in October 650,000 people closed their bank accounts and put the money into credit unions. The leader of the opposition is not Ed, but Occupy. ‘Feral elite’ coined by Neal Lawson and made famous by the Guardian. Believe in utopia. This is not our utopia. It is a world of private, individual selfishness and greed. Be a visionary. With the elite, there are no feedback loops. Utopian good society. Public and social. It will not happen quickly. Protest, struggle and democracy. The notion of the ‘Public Good’ was written out of legislation in 2004. And in the US in 2005. Coffee houses of the street. Encourage people into the street. At the end of March, it will be the end of the public health service. And the BBC certainly isn’t. LINK. Google and Facebook are big corporations dealing in online data. We can take control. Free schools and academies are privatisation. The data is skewed. It will privatise and centralise our school system. It will teach Latin and Churchill – of the markets and the right wing. People who believe in markets are cultists. It is not rational. Market fundamentalists. Nationwide would rather lend to buy-to-lets than first time buyers. The Labour Party have been given it on a plate and they are hopeless. Lord Philip Green doesn’t pay any tax and his money is in a bank account in the name of his Monaco wife. ‘Transform capital management’, ‘economic foodchain theory’. Incentivise business to be more of the solution than the problem. Legal public spaces are constricted. Go where you don’t belong. How do you get people talking? Street party. Discourse. Inability to voice concerns. Anybody can have a voice. We have a right to gather and talk. Go to where you live and start the act of thinking. We have to be good. Vote Occupy London in the mayoral election. Trade unionism is currently being attacked by the government. The tax payer is having to pay for them to exist within public institution. They protect the rights of taxpayers. The Guardian in 90% National Union of Journalists. Speak to our neighbours and go from there. Pop-up Southbank assemblies all over London? Local campaigns. Collaborative consumption in your area. What can we do with the space lost to City roofs? Defend the public sphere and build a better one. This entry was posted in Uncategorized on February 1, 2012 by kirstystyles1.